A TBI public symposium, “Prehistory of the Turkana Basin: Opportunities and Priorities for Future Field Research,” was held at the United States International University (USIU) in Nairobi on August 18, 2008 to celebrate 40 years of paleontological and archaeological research in the Turkana Basin in northern Kenya. The symposium was introduced by Prof. Freida A. 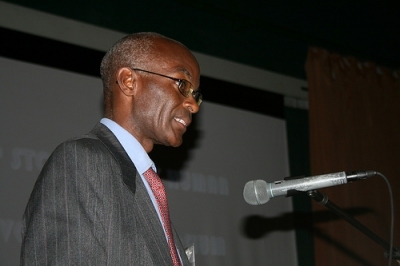 Brown, Vice Chancellor of USIU, who received the diverse group of scientists at the University’s campus located 20 minutes from downtown Nairobi. The morning talks started with Richard Leakey (Stony Brook University) providing his impressions on the last 40 years of research in the Basin. The title of his talk, “Where we came from and where we are going” was the common theme that encompassed all discussions that took place that week. Leakey introduced the idea of TBI to all attendees and conveyed the importance of having a robust infrastructure behind the research for the next 40 years. After this inspiring talk, Joe Sertich (Stony Brook University) presented the audience with a puzzling 40 million-year-long gap in Africa’s vertebrate fossil record, from approximately the Late Cretaceous to Late Paleocene, when non-avian dinosaurs went extinct. Sertich presented the findings of his recent fieldwork in West Turkana, including several dinosaur fossil remains which, Sertich emphasized, are key to understanding the nature of dinosaur and mammalian evolution in the Late Cretaceous of Africa. The morning concluded with a presentation by Meave Leakey (National Museums of Kenya, Stony Brook University), who recapitulated the successes and findings of the last 40 years of the Koobi Fora Research Project. Since the beginnings of the project by Richard Leakey in 1968, many findings of the Koobi Fora project have been crucial in understanding the origins of humans. These include the discovery in 1969 of a nearly complete cranium of Paranthropus boisei (KNM-ER 406); the 1972 finding of KNM-ER 1470; the cranium of Homo habilis (KNM-ER 1813) from 1973; a cranium attributed to Homo ergaster (KNM-ER 3733) in 1975; the remarkable 1984 finding of the Turkana Boy (KNM- WT 15000); the 1985 discovery of the Black Skull (KNM- WT 17000), attributed to Paranthropus aethiopicus; the 1994 discovery of Australopithecus anamensis (KNM- KP 29281); and Kenyanthropus platyops (KNM- WT 40000) in 1999. The afternoon session began with a talk by Fredrick Kyalo Manthi (National Museums of Kenya, TBI) on his study of micromammal fossils to understand the environments of the early australopithecines. He described his current postdoctoral work and his future plans, and was in high demand to analyze small mammals from nearly everyone with current projects in the Turkana Basin. Thure Cerling (University of Utah) discussed the use of stable isotope compounds to identify important environmental attributes of fossils, with applications such as reconstructing dietary changes in mammalian lineages over millions of years. Francis Kirera (National Museums of Kenya, TBI) shared his knowledge of the use of different methods for paleoenvironmental reconstruction and highlighted fascinating applications of high-end technology such as GIS, differential GPSs to improve data collection and analysis. Hélène Roche (C.N.R.S., France) followed with an overview of the evolution of tool technology in the Early Stone Age, enlightening the audience with the West Turkana Archaeological Project findings on technical achievements of early hominins, from 2.3 to 0.7 million years ago. Their technological analyses showed the existence of planning and forethought by hominins in acquiring and managing raw materials as early as 2.3 million years ago. The symposium concluded with Karega Munene’s (USIU) final remarks on Kenya’s role in human evolution research, its history, and its future. His talk focused on the cultural impact of research and it was through his commentaries and examples of differences and similarities in cultural practices that paleoanthropology was placed into the broader world of cultural anthropology.